When the Kalamazoo factory unveiled the Flying V as part of Gibson’s Modernistic Series in 1958, many in the industry had their doubts about the success of the unusual design. The angular Flying V didn't look like any guitar on the market and it was not easy to play sitting down. But before long, the "V" had some serious champions like Lonnie Mack, Albert King and Jimi Hendrix. Now, Epiphone brings back the once limited edition legend with our 1958 Korina Flying V featuring gold hardware, a gold string-through body bridge, and Alnico Classic Pickups™. 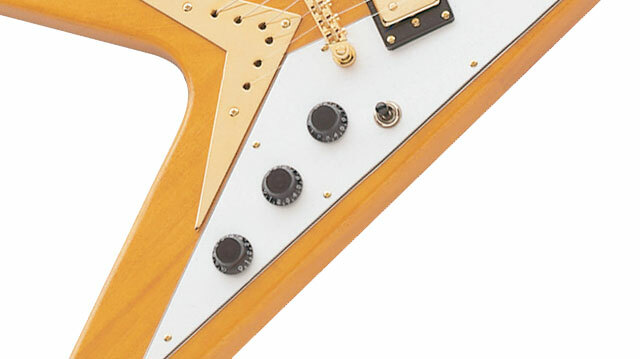 The 1958 Flying V features our Limited Lifetime Warranty backed by world famous 24/7/365 day Gibson Customer Service. Visit an Authorized Epiphone Dealer today and make a name for yourself with the 1958 Flying V.
Controls Neck Volume, Bridge Volume, and Master Tone with full-size 500K O potentiometers. Korina is one of the best tonewoods for guitar bodies and features tonal characteristics similar to mahogany but with added mid-range, which makes it a perfect fit for the 1958 Flying V's Alnico humbucker pickups. 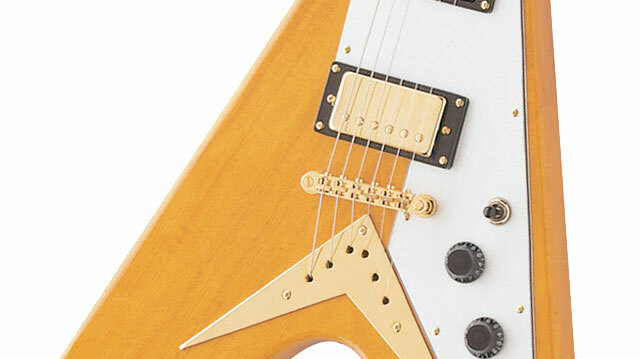 The 1958 Korina Flying V features a solid Korina body using the same dimensions as the original with a glued-in Korina neck with a 24.75” scale and a SlimTaper™ profile. 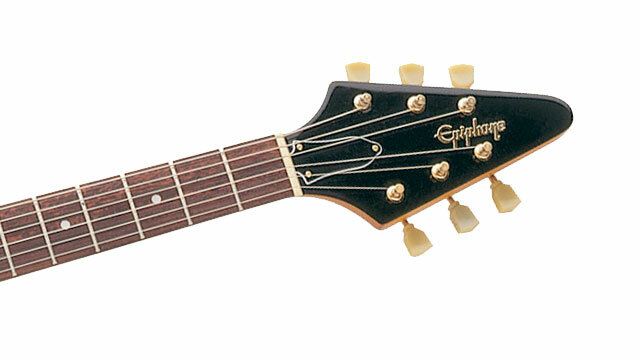 The rosewood fretboard has a 12” radius, a 1.68" nut, and features pearloid dot inlays. The power of the Flying V comes from our Alnico Classic™ humbuckers, which have all the subtle tonal colors and warm crunch found in vintage PAF humbuckers. Like all Epiphones, the 1958 Flying V comes with all-metal hardware that's built to last a lifetime. Along with gold premium die-cast tuners, the 1958 Flying V includes our gold LockTone™ Tune-O-Matic StopBar bridge and full function classic gold Speedvolume-style knobs for each pickup and a gold Speedtone-style master tone knob using full-size 500K O potentiometers.